New sneakers are dropping every week so there’s no shortage of releases to keep your rotation fresh. But one thing becomes clear eventually – some kicks are all hype, while others stay on our minds and feet for the long haul. While we can’t always predict what becomes a classic, sidestepping the hype train is a tactful way to buy new sneakers. With that said, below I’ve included a list of the best sneakers you can cop right now. These aren’t just-this-minute releases, but they’re all fresh. Overall, the best pick here is the Balenciaga Speed Sock. While it’s not your everyday sneaker, it’s comfortable and practical enough to be worn around town with a design that’s low-key enough to avoid ostentation. The Speed Sock is in demand because it’s simply special. It’s not insanely expensive yet is high on quality and style. The fashion crowd has been going bonkers for this silhouette and for good reason. It ticks many boxes for design, wearability and more. Other models you’ll want to pull out the credit card for include Salomon’s insanely practical S/LAB runner, Gucci’s bold, logo-heavy Rhyton, and the effortlessly cool Achilles from Common Projects. Whether you’re after comfort or out to make a statement, there’s something for everyone here. You can’t go wrong with the Achilles from Common Projects. The minimal white leather upper is combined with gold stamped serial numbers on the heels, leather linings and rubber soles. This might just be the perfect all-round sneaker for spring/summer. Common Projects has a reputation for quality and the Achilles is no exception. Whether you’re into the pinroll trousers look, dad chinos or denim shorts, this silhouette is simple enough to go with just about any outfit. Understatement is the key here and if that’s how you roll, this should be your next purchase. You can never pass up on a classic like Nike’s Air Max 95. While it doesn’t pack the lustre of the Air Max 97, this silhouette still has a cult following of its own. While more on the functional, rather than the aesthetic, end of the athletic spectrum, this grosgrain-trimmed colourway is your everyday sneaker and more. Made from tonal-grey faux suede panels across the upper, and paired with white and black mesh, this is certainly a sneaker you could wear to the track just as you could a street style photoshoot. And while the midsole doesn’t have the prettiness of newer silhouettes a la Vapormax, there’s something refreshing about a sneaker that’s unapologetically stylish. These low-tops from Y-3 are yet another example of the fusion of sportswear and fashion that the brand has become famous for. The panelled neoprene upper is combined with mesh for a design that’s both soft and textured. The laces are secured with grosgrain piping along the upper which is complemented with off-white suede trim. Aside from the many other details that make the Kusari silhouette stand out is the Boost midsole. Not only will this be a comfort cushion for your feet, but also a marker of your taste in streetwear and the oft-debated marriage of high-low within contemporary fashion. Crime London was founded by two Italian sisters, and is inspired by the time they spent in London during university. The alternative scenes in Shoreditch and Camden Town and the cultural clash of Brick Lane have all had an impact on Crime London collections. We love these classic low top sneakers, made from premium full-grain leather, and with black accent on the heel. Buy them from Farfetch for £158. It’s no secret that the Air Max 97 is the beloved silhouette of sneakerheads the world over. And what better way to rock it than with a newer, more technical midsole than Vapormax? This low-top comes in a canvas and faux-leather upper in white, purple and silver tones and are a solid combination for a sporty ‘fit, or just a pure street style look. This model features a logo patch and grosgrain pull-loop that match the silver highlights throughout. Aside from the deep varsity shade of purple strewn about, you’ll find a transparent rubber Vapormax midsole to provide not only cushioning and comfort, but a killer combination of 90s Nike design along with contemporary technology. Balenciaga’s Speed Sock has quite possibly appeared in every street style gallery since it dropped. The slip-on sneaker features a knitted sock-like upper paired to a chunky, angular midsole. This makes it actually comfortable and is stylish enough that you’d still look dressed up even if you dressed it down. This particular model is being sold exclusively at Mr Porter’s webstore. The clean grey colourway is versatile enough to match well with a variety of outfits, particularly streetwear. The Speed Sock’s ‘memory soles’ apparently get comfier each time they’re worn. Whatever – these sneakers will add fire to your outfit, so don’t wait to cop. While you might have been caught up with all the hype of the Virgil Abloh x Nike “The Ten” collab, this high-top sneaker from Abloh’s Off-White brand is a solid investment. With typically ironic detailing we’ve come to expect from the brand, this is a true fashion sneaker in every sense. This pair has ridged white rubber soles, a red zip tie on one shoe and a spare set of bright-green laces on the other. While you might have trouble copping this directly from the brand’s webstore (keep an eye out for restocks), you can find it directly at the link above. Balenciaga’s Race Runner has been updated from previous iterations. While it’s known for being worn by celebrities, the Italian-made sneaker is subtle enough that you could wear it casually as well as when you take the Ferrari out for a spin. Even so, this is one for the style mavens – so you might want to leave your faded Levi’s out here. Available here in a navy colourway, this version is constructed of neoprene, leather and mesh and also features elasticated strap detailing around the upper. Finishing touches include suede at the heels and rubber outsoles. Adidas’s Boost-soled sneakers have been around long enough that you just might have a pair. That doesn’t mean you should stop at one or more – especially when you take a look at the NMD City Sock. This particular CS1 variant comes equipped with Gore-Tex linings, meaning you’ll have extra waterproofing over the standard model (great in the spring). Essentially what you’re getting here is the best of everything from Adidas plus some extra technology thrown in for good measure. You can style this with your favourite streetwear brands and, aside from the Boost-Primeknit comfort combo, this is still a comparatively affordable crep. In 2017 we saw oversized logos make a splash not only on the runway, but also across some of our favourite sneakers. The Gucci Rhyton was no exception, with the kicks receiving several different logo combinations that are impossible to overlook. In contrast to the more subtle graphics printed on the Gucci Ace, the Rhyton is all about extroverted branding and perfect for posting on the ‘Gram. The silhouette itself is based on the '80s-inspired Rhyton, with this particular pair made in Italy from softened washed leather. The massive print used on the upper leaves no question that you’re donning Gucci footwear and allows you to flaunt your style unapologetically. Salomon should be on your radar if it isn’t already. Recently gaining attention from the fashion crowd, the French brand has earned its reputation for producing quality outdoor gear that’s also stylish. The S/LAB Black Edition Speed Trail runners pictured here are an example of both a stylish shoe you could wear in hot or cold and dry or wet climates, but can also be paired with shorts, trousers or leggings. This versatile sneaker is one you’ll actually want to wear, rather than keep box-fresh in your collection. Its low-key styling and decent price point makes this a great value purchase. Features include anti-debris mesh and rubber for an overall lightweight construction. The 'Contagrip' rubber midsole allows the S/LAB to handle literally any conditions you could put them under. Fancy hiking in the summer then? This high-top from Jerry Lorenzo’s brand Fear of God is definitely not for everyone. Its bulky design and hefty price tag mean that if you’ll be copping this, you’ll want it because it’s dope and not because you saw it on Instagram. But when you don these high-tops, there’s no mistaking that you’re in-the-know when it comes to style. Even from across the street you’ll notice FoG’s trademark serrated outsole. Made in Italy from premium nubuck, the rugged look have been inspired by hiking boots. While the black upper on this particular colourway might be a little simple for some, this is another fashion-focused sneaker you’ll actually be wearing rather than leaving clean in your collection. Vetements and Reebok drummed up a lot of hype for this collab when it dropped about a year ago. While not cheap, this is a statement piece that will both turn heads and show that you’re a discerning sneakerhead. It features slick branded mesh, leather and rubber, and the midsole and large pull-tabs also add to the chunky aesthetic. Add to that the meme-like eye roll and kissing faces that allow you to pump the upper for a snug fit. Once you’ve done that you’ve got yourself one of the must-have sneakers of the minute. The Saikou is set to be one of the most popular in Y-3’s SS18 sneaker collection. 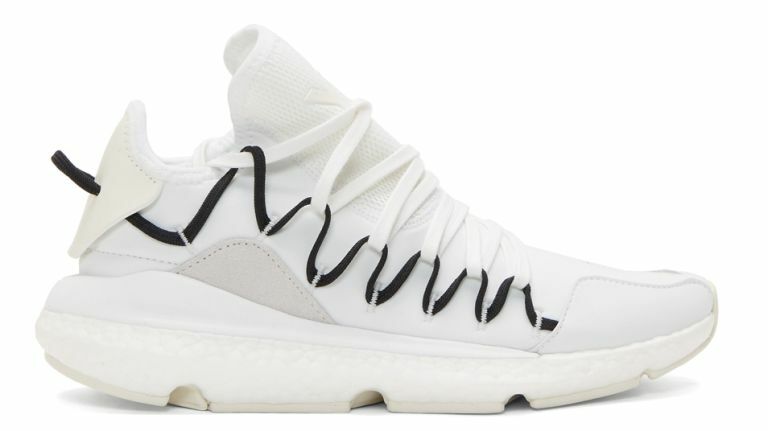 As we see with every release from Y-3, Japanese designer Yohji Yamamoto’s collaboration with Adidas, there’s a little bit of everything weaved into each silhouette. With the Saikou, made with a comfortable Primeknit upper, you can see a strong ‘90s influence particularly around the toe box. The bold Three Stripes logo on the tongue is a nice touch and flows well into Yamamoto’s minimal design. To top it off, the Saikou features a Boost midsole – although it’s not likely you’ll be taking these out to your next track and field day.